We are excited to present to you the new 2019 collection of Aqua Marina, which is available now for purchase via Q Watersports. In our opinion it is the best collection of watersport & recreational products by Aqua Marina ever yet! On this page you will find a selection of the Aqua Marina SUP boards that are available for purchase at Q Watersports. You can also view the 2019 brochure. The classic Aqua Marina all-round line is the most popular inflatable sup board line in the world. 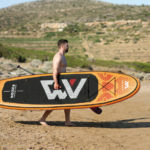 The budget friendly line is easy to transport, simply to set up , stable and versatile This is simply the guarantee of inflatable sup fun for all levels of riders! The all-around boards are upgraded for this season. The optimized thickness provides outstanding rigidity without additional air pressure, whilst the extra volume caters to those looking for an even easier ride. The new BREEZE / VAPOR / FUSION SUP are the ideal all-around model to get into stand-up paddling and offer great balance with good glide and manoeuvrability. The new Aqua Marina all-round advanced line is the ultimate inflatable sup board that everyone can enjoy. Stiff, light and durable. The neatly packed all around advanced boards inflate into delicately tuned shapes for flat water and small surf fun. The all-around advanced boards are best sellers, offering fantastic versatility and boasting unrivalled quality, innovation and design. Designed for use across a wide range of conditions, by all kinds of riders. The shorter models are better suited to catch some waves, while the longer wider models are aimed at bigger paddlers or at families who will be paddling together on one board. The two sizes of 11’6” and 12’6” are fast, very easy to paddle and keep balance, even if you are a first-time SUPer. The 6-inch thickness gives incredible rigidity while extra volume keeps you and your luggage up and dry. Unsurpassed stiffness and stability brought by the new double chamber construction make HYPER ideal for carrying camping gear, whilst their streamlined outline makes them perfect for high-speed cruising enabling you to paddle further and longer. The HYPER inflatable touring board is going to be all the explorers’ favourite transportation. The new Aqua Marina RACE is in two lengths of 12’6’’ and 14’0’’, in widths of 26’’and 27’’, that gives enough stability to be in control when conditions get choppy, yet fast and slippery to cover distances quickly. With the extra stiffness and rigidity from the lightweight double layer technology, this board will make you question a hard board. The combination of speed, stability and floatation is so impressive for such narrow boards. The tool-free slide-in Race fin makes the new RACE a ready-to-race package. View here also a selection of the the stand up paddle board categories Aqua Marina offers. DHYANA, PEACE and YOGA DOCK are for fitness, yoga and pilates fans. CHAMPION is for windsurf beginners looking for the perfect way into the sport. With the SUPERTRIP and MEGA families and friends can experience the ride of paddle board together.